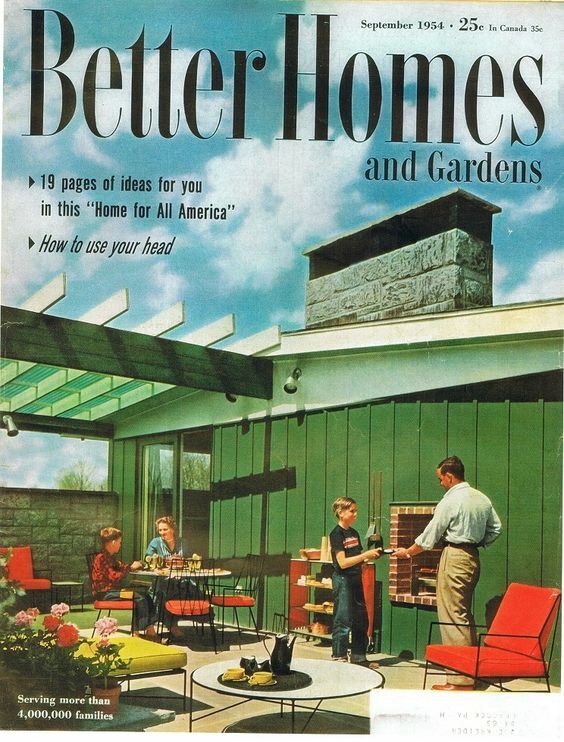 If you are the new owner of a Mid-Century Modern home, congratulations! Now to the hard part…how to get the look you love. Forget what you see on HGTV/Martha Stewart/Oprah. 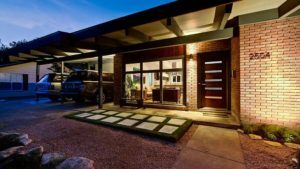 Mid-Century modern has its own look and it will keep its value if you follow these simple rules. I have come up with these thoughts after making many mistakes myself over the years. I hope that sharing my hard-earned knowledge will help you find your own Mid Mod style. Live or spend quality time in your new home awhile before starting work. You will begin to appreciate the functionality, special features, and details. You will also quickly discover what works and what doesn’t. I can’t tell you how many people, including myself, regret updates that they made to their house before they fully appreciated the details. Start slowly and carefully and discover what’s great about your new Mid Mod home. “God is in the details” – so don’t destroy them! Mies van der Rohe’s famous quote may seem a bit surprising at first, since he was famed for simplicity. But Modernism is all about the details, so be careful when doing your demolition to save what’s important. Take your time to study your new home and learn what is special about it. Some examples would be original brickwork, front door, stone, ceramic tile, interior built-ins, vintage stereo system, and any unique features. Just remember that once its gone, you can never put it back. Many times a tired looking front door might look great re-painted or re-stained a new color. If it hasn’t been painted, don’t paint it. Don’t be too quick to replace old cabinet, door hardware, and light fixtures. Keep old plumbing fixtures if they still function. Contrary to popular advice, you don’t have to contemporize your kitchen and baths. Mid-century bathrooms are like classic cars. 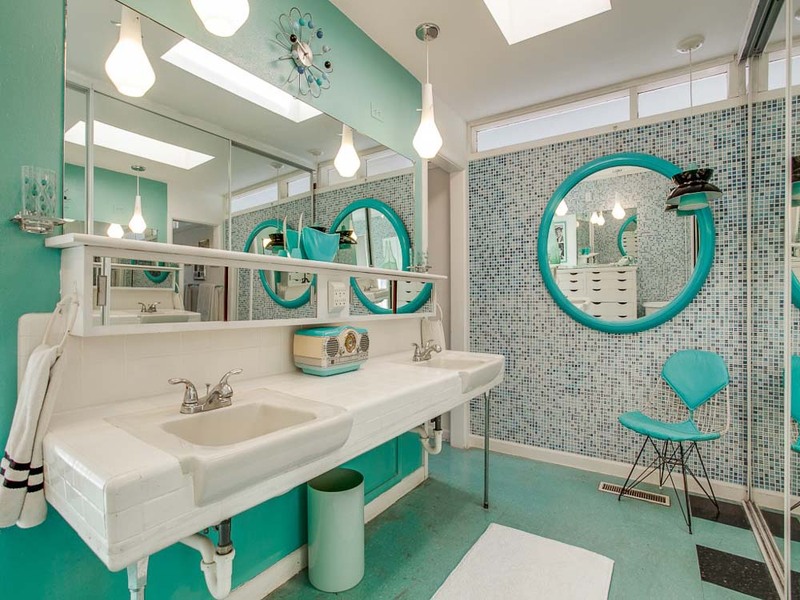 They have a special look often with pastel colored fixtures, amazing tile, and lots of chrome. Often these bathrooms can be restored to be both functional and beautiful without spending a fortune to replace everything. Many old sinks, toilets, faucets are higher quality and much sought-after, especially Crane. If you have pastel bathrooms with color-coordinated fixtures – live with them awhile before you think about tearing it out. You may find out that you love them. Built in electric heater grates in bathrooms can be re-chromed and look fabulous. 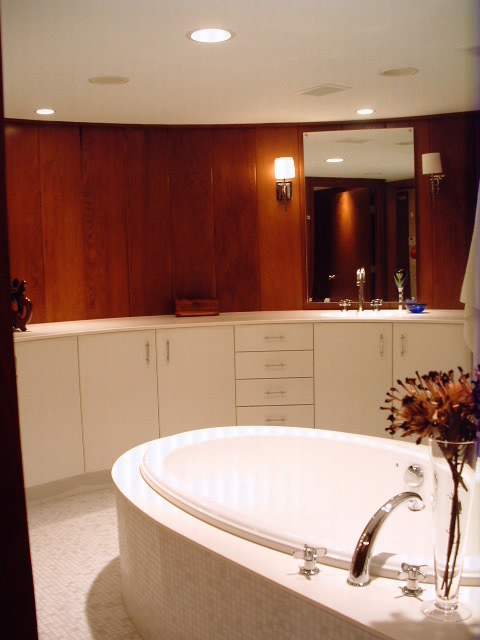 When choosing new bathrooms – go with timeless, not trendy. 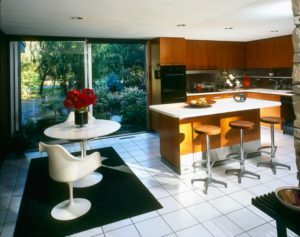 For example, remodelers are all in love with Vessel above counter sinks, but they scream “New Millenium!” not Mid Mod. Check www.retrorenovation.com for lots of ideas and suppliers of bathroom and kitchen products. Don’t rush to put in a new trendy floorcovering. The floor is a huge area in your home and makes a big impression. Mid-Century modern houses typically featured natural stone floors such as slate, terrazzo, bluestone, and travertine. This look can also be achieved with some of the wonderful new porcelain tiles that look exactly like limestone or slate but are so easy to clean. 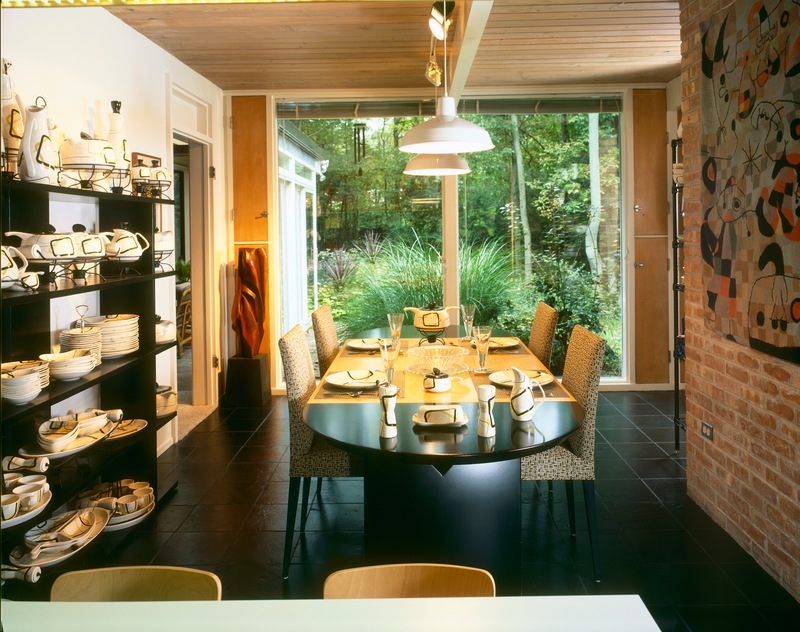 Cork is also traditional, and although beautiful, even the newly engineered cork floors will fade in a sunny room. Natural concrete is a fitting and durable choice. Wood floors are an option if you choose the right look to go with your home. The latest trendy (for example) bamboo floor will end up looking dated soon, and not fit the Mid-Century aesthetic. 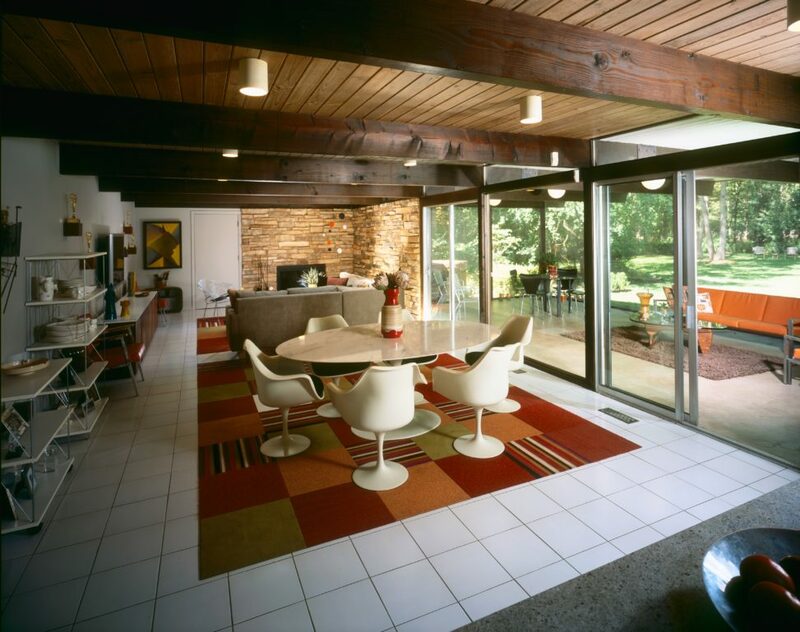 Use carpeting and area rugs in the Mid Mod home to warm the interior and dampen sound. For carpet – go with solid colors, Berber, Flor carpet tiles, and shag. Good choices for area rugs are Scandinavian Rya, Moroccan or Flokati. No Shaker Cabinets in a Mid Mod Kitchen. If your kitchen and bathroom cabinets are original – do everything you can to save them. Refinish, rebuild, fit the insides with organizers to make them more functional. If you have to replace them, choose clean-lined cabinets with no panels, no molding, no trim. Choose no hardware or simple Mid-Century style round knobs for new cabinets. Study photos online of kitchens in the era of your house to get ideas. Don’t make surfaces too shiny. Mid-Century modernism is all about texture and matte finishes. For example – tile: shiny glass tiles are OK in small doses, like a backsplash, but matte glazed tiles look classic and timeless. Paint – use matte or eggshell if possible. Textures and accessories like grasscloth wallpaper, nubby upholstery, shag rugs, and art pottery carry out the theme. Don’t replace fixed pane glass windows with multi-pane windows. 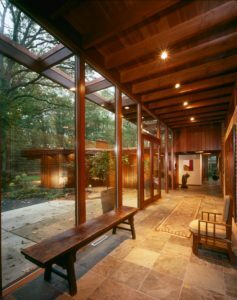 Mid-Century modern windows are usually large panes with no mullions. If you have to replace windows, get the most accurate replacement available. 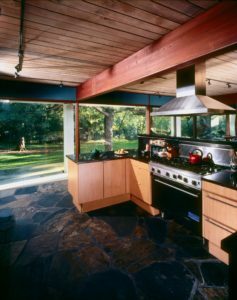 Never use vinyl wrapped, double-hung windows on a Mid-Century house. 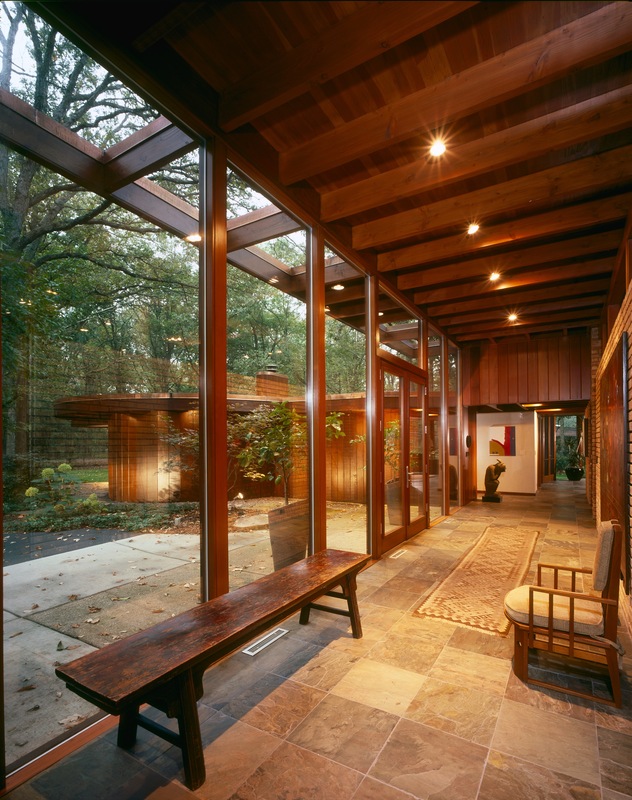 Stained glass windows are fine in Craftsman or Wrightian homes, but not in Mid-Century modern. Do not replace fixed pane glass with prefabricated windows. In warm climates, aluminum window frames were the standard. In cold climates, always use wood. This goes for sliding doors as well. Front doors should be in Mid-Century style. Your front door is the first thing your family and friends will see and touch. Keep it simple, no etched or stained glass, or ornate motifs. Simple flat panel door painted an accent color is one easy way, like orange, yellow, or red, depending on your color scheme. Reproduction Mid Mod doors are also available from www.crestviewdoors.com. Books: Vintage decorating books and magazines are the best sources for ideas, as well as any book showing exteriors and interiors of Mid-Century homes. Don’t be afraid to steal (be inspired by) a great idea from someone else’s home. This article deals with the aesthetic aspects of your home, not the infrastructure. Checking to see if plumbing, electrical, heating/cooling need updates should always be the first step in making your new house a comfortable home.